By Dave Yochum. Like a teenager on whole milk and Wonder Bread, Cornelius is growing up before our very eyes. The town’s population of nearly 29,000 means that the Cornelius-Lemley Fire Department is being pulled in every direction. Literally. Neal Smith, the new fire chief, says the town’s fire trucks are increasingly seen responding in multiple directions at the same time. Overlapping calls occur 55 percent of the time, says Smith, a career firefighter. “While we’re responding to the scene of one call, a second call is dispatched,” he says. That leaves no one on duty at either of the town’s two stations. Smith, who is 49 years old, might seem like an unlikely candidate for fire chief, but he isn’t. His father was an accountant in Charlotte, his mom was a homemaker. The youngest of three children, they grew up on the old Griffith Dairy farm in Davidson. The dairy was run by Smith’s grandfather, Thomas Moore Griffith, who was mayor of Davidson during the Depression. The farm was to the east of Main Street, about where the Twin Oaks neighborhood is now. It’s also where Smith, wife Kristi and their two children have their home. The chief is a 1984 graduate of North Mecklenburg High School who went on to Appalachian State where he majored in math and minored in physics. In fact, he started out his career teaching. But a couple of things happened. The first is that Kristi’s father, Jimmy Bumgarner, and her brother, Jamey Bumgarner, were firefighters. Both served as Cornelius-Lemley fire chief. Kristin’s grandfather, Hollis Reid, was one of the founding members. “When I started dating her, they would take off and go to fire calls and i just caught the itch. I went with them,” Chief Smith says. The second thing was that as a young teacher in the Mecklenburg County system, he was taken aback by the alarmist budget reports every summer: Teachers might not get hired back in the fall. “They would tell you your job might not be available…so I went on the Charlotte Fire Department in 1991,” Smith says. He serves as chief of Charlotte’s Eighth Battalion which covers all three airport fire stations. Two dozen people report to Smith, who works 24-hour shifts and has a bedroom at the station in Charlotte. Rank and file firefighters sleep in a dorm setting. 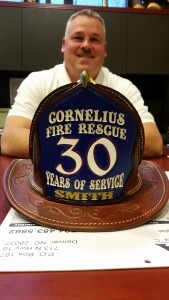 Back in Cornelius, Smith runs a department with the help of a solid team. “I can’t do this job without everybody else here. There’s just no way. I have people I depend on…without all of them in and doing what is expected, this place would not function well. Just because I’m the chief…I’m not doing it all, not by any means,” Smith says. His peers elected Smith chief, a testament to his dedication, leadership and intelligence. He is paid $30,000 a year as chief of Cornelius-Lemley Volunteer Fire Department. As a separate entity from the town, the 77-member force provides fire services like a vendor or contractor to the town. Some of the firefighters on duty are volunteers, while others are paid on a per diem basis. Life as we might have known it growing up is changing. Twenty-five and 30 years ago, many people worked close to where they lived. Commuting all the way into Charlotte was unusual. Now, with the population doubling, people of firefighting age work somewhere else, not necessarily in Cornelius. Per diem firefighters fill shifts that can’t be filled with volunteers. Eight firefighters are on duty at any given time, so the department can respond to calls in an average of less than 4.5 minutes, considerably less than the national standard of six minutes. Indeed, among a peer group of 20 communities in North Carolina—10 larger and 10 smaller—Cornelius is the only one with a volunteer fire department. How long that can continue is anybody’s guess. “I don’t have people knocking on the door to be a volunteer fireman any more,” Smith says. Across the nation volunteerism is dying, or at least changing. Service clubs are smaller, the small-town feel is disappearing everywhere, not just Cornelius. A third fire station, on Westmoreland is under consideration, based on Cornelius’ growth, but it’s unclear whether it would be closer to Hwy. 21 or West Catawba. Smith runs the business of the fire service, and studies things like where to put the next fire station. But on any given day, he’s thinking about the firefighters on the job. “You hope and pray if they go to a fire, they get it knocked out and go home safe,” Smith says.